Things are happening in Rome. In the previous post you saw the work in progress in via delle Carrozze. The pavement and the cobbled streets of the Tridente are being refurbished, courtesy of Louis Vuitton Moet Hennessy. 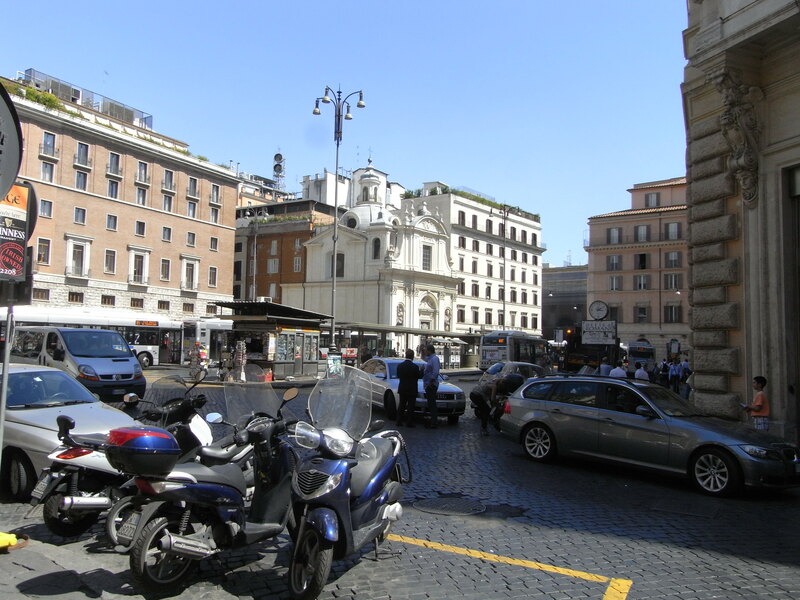 Yesterday I was notified, as a fidelized public transport user, that the Piazza San Silvestro bus terminus will disappear on Monday and works will start for a new pedestrian-friendly piazza. The set-up you see here below will be a souvenir. In the photo opening this post you see our local baretto. Also the baretto is being refurbished, I took the picture on the last day of operation with the old layout. This is where for the past 10 years, since June 2001 precisely, MeinMann and I have been consuming cappuccini, cornetti and news in the morning. Agnese (pictured), Sebastian and Gaia are the first multi-kulti smiles we see on our way to work – their assessment of weather conditions calls for cappuccino freddo, tiepido, caldo or the special-situations caffellatte con il miele…a friendly smile is much better than Starbucks’ stale marketing, I tell you. Tags: Frecciarossa, Krasnaya Strela, Lufthansa, multikulti, Red Arrow, ruble crisis 1998, Trains! An excel spreadsheet, A3 format, full of travel details, business meetings and appointments with friends after work. It’s one of those trips…there are business meetings in a couple of european cities, and since a flight is a flight, some optimization of logistics and CO2 reduction call for saying hallo to friends in between two stops without coming back to Rome in between! And at the end, a weekend in Moscow with MeinMann!! In 1998, right in the middle of the Ruble crisis, I crossed Russia on the inspiring Krasnaya Strela. What a beautiful experience. The first page of Philip Roth’s “In Russia” – one long whistle blow gets lost in the night, the ship of the taiga leaves for and endless ocean of land. No Red Arrow this time round. Just the crisp apron of the skies, Lufthansa . Still, I’m leaving with a red train tomorrow, the Frecciarossa. And about the Ruble…we will see! Bingo! The best kept country’s secret, the debacle of the first quarter GDP, is out of the bag. Beware of disfattismo! We weren’t told the figures in order to keep our optimism and remain upbeat! With a little governmental Schadenfreude for our friends, Spain and Germany, during the past months. Interesting to note: THE BASE. I hate to admit it, but yes, I work with numbers and each time someone gives me a % variation, I ask myself: what was the bloody base? Q1 2008 GDP growth in Italy had been +0.4%. Anaemic bordering on fainting. Always look behind a number. There’s another one. Don’t worry, tomorrow the news will be focusing again on security measures, over zealous ronde, anti-multikulti attitude. Elections oblige. Bingo. There’s a lot of talk about the end of printed newspapers. While I hope this won’t be the case (for the good ones), German newspapers are tackling the issue by enriching their online editions with tools unavailable to the paper edition: interactive maps. This spring the Morgenpost published the Social Atlas of Berlin. It’s interesting to visualize on these maps the demographic structure of each Berlin area. It’s fun to push the buttons and see what % of people under 14 or above 65 live in your same neighborhood. You may discover a thing or two you didn’t know! Good to see tools more interesting than slide-shows or embedded youtube paraphernalia on online newspaper editions…I wonder when Repubblica will come up with a similar map for Rome! 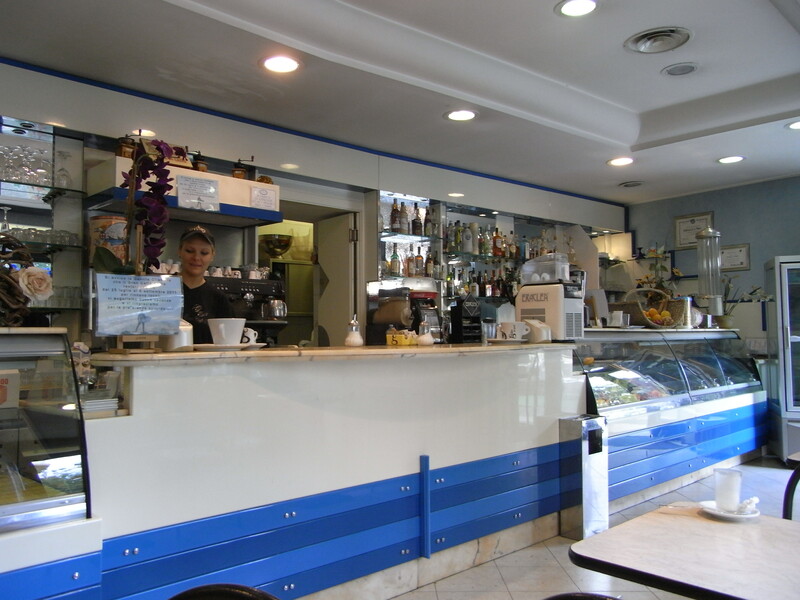 The Bar Necci will reopen tomorrow night in the quartiere Pigneto, only 14 days after the arson attack. The same builders and carpenters who refurbished it have re-created the caffé, apparently only the original wallpaper was impossible to source but all the rest should be there! Check out La Repubblica’s article…the Bar not only was the stage of Pasolini’s “Accattone”, but also for the movie “Questioni di cuore” with Antonio Albanese (the fabulous “Minister of Terror” on tv, “Tage und Wolke” on screen) and Kim Rossi Stuart (photo). Sunday 19th, today we saw the movie by Francesca Archibugi, not to be missed. The idea of rebirth after a traumatic episode. An unconventional scenery of Rome, an old Fiat 500 and great actors. The storyboard comes from a novel by Umberto Contarello, listen to the interview with the author by clicking on the links. The transition between eternal teenage, maturity and old age and the risk of jumping the middle step, or missing it altogether. A late Bildungsroman. Last sunday I was browsing the newsstand at the now beautiful Zurich airport and I stumbled on Dummy, a perfect magazine. I discovered in this month’s issue – dedicated to Berlin – the high-density impressions of Berlin by Edward B.Gordon. The landscapes, the details are so intense. No photos in the magazine, only paintings! In-depth reportages on the social dynamics (or statics) of the town. That’s what I call a perfect magazine. No lazy journalists’ rechauffe’ here. I agree with Dummy, the image imaginaire of Berlin is somewhat flattened out by the typical travel-magazine photos. Sony Center, B.Tor, Reichstag, always the same images. Gordon manages to take out the sunny corner in the cafe’, the biker’s outfit colors ricocheting on the wet tarmac, a glimpse over the neighbour’s book in the U-bahn. So, here’s a painter’s blog I will check up regularly and a clever magazine I will keep on buying (wonder if they can ship abroad with an Abo? I don’t fancy spending too much time at Zurich airport, after all…) . Talking about contents, the articles about Berlin are super. Especially one, about Berlin’s dignified poverty. Triest also belongs to the club of poor towns. It seems that past trade powerhouses, once very organized and buergerlich, somewhat retained their dignified posture also when trade winds of history stopped blessing them and disappeared. They became unterstuetzt, were fed chocolate and cigarettes by the Amis, grew spoilt if you want. Reality check followed suit, together with Arbeitsloesigkeit (unemployment) and decaying urban landscapes.